I purchased the original edition of this book shortly after its release in 2009, and read it from cover to cover in a day. Perhaps ‘read’ is not quite the right word- devoured, is probably more accurate! I was certainly hungry for the knowledge Todd had packed into it, and its sleek cover encased a particularly comprehensive guide to making and applying prosthetic makeup. Now Focal Press have just released the Second Edition, with even more fantastic information and techniques. Unlike a lot of the standard makeup tomes (although they are valuable repositories of information in their own right) “Special Makeup Effects for Stage and Screen” covers all of the latest industry techniques and materials. Not only does the book provide in-depth explanations, it is illustrated with fabulous photographs, in easy to follow chapters, covering the entire process of Prosthetic Makeups from Design to Application, and more! While perfectly suitable as a self-teaching manual – it is clearly laid out, like any good textbook, it also provides a great reference book for more experienced Makeup Artsist wishing to brush up on industry-standard techniques. LEVEL: Suitable for people with some experience. Several short years ago, before the internet grew to its current size, the best source of information was books, but those worth the money were often hard to find and even harder to buy. The situation is a little different now, but although a lot of information can be found on one or other website, it is fragmentary, often lacks adequate explanation, and is sometimes downright misleading, and on occasion, dangerously cavalier about safety and the use of hazardous materials. Besides, most of us can’t take the computer into the lab or workshop to use ‘on the job’! There is still no substitute for a good collection of instructional books on the subject to teach you what you need to know in this highly specialised field. This one also comes with a handy featuring tutorials and other useful info! 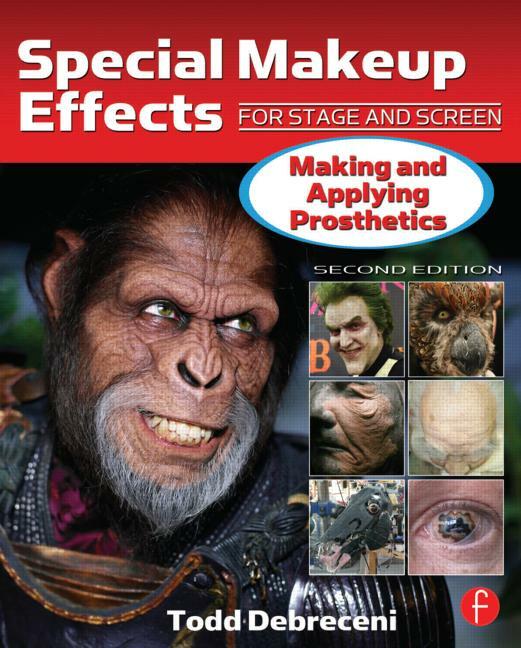 One of the standout features of this book is that the author has friends and contacts in the Special Effects Makeup industry the world over, and in the second edition of this book he has collected the wisdom and expertise of some of the greatest talents in the business. Everyone I know who has it agrees that this book should take a prime position in the library of every self respecting Makeup FX Artist. And I am not just saying that because I was fortunate enough to make a small addition to this edition!! The Second Edition has an extra 175 pages in it, an increase of over fifty percent, and bringing it up to a grand total of 499 pages! This entry was posted on Wednesday, February 6th, 2013 at 11:57 am	and tagged with film makeup, Focal Press, learn sfx makeup, Makeup Effects, Makeup FX, makeup fx artist, makeup fx books, mold making, mouldmaking, prosthetics, sfx, silicon, special effects, Special Effects Makeup for Stage and Screen, Todd Debreceni and posted in MAKEUP & FX BOOKS & DVDS, Makeup FX. You can follow any responses to this entry through the RSS 2.0 feed. « How Will You Know When Your Dreams Have Come True?